This is a great time of year for cooking. The last vestiges of sweet summer harvest are still upon us, with the added appearance of fall squashes and a resurgence of cool weather greens. The hasty days of summer have given way to chilly, dark mornings and eves, perfect for cozying up in a kitchen warmed by bubbling pots of tomato sauce and baking zucchini bread. Yes, this is one of the best times to cook. Since I am an over-eager purchaser of fresh Maine veggies, I’m looking forward to doing loads of cooking this coming weekend and sharing some of my kitchen curiosities with friends at the Portland Food Swap on Tuesday, October 8. 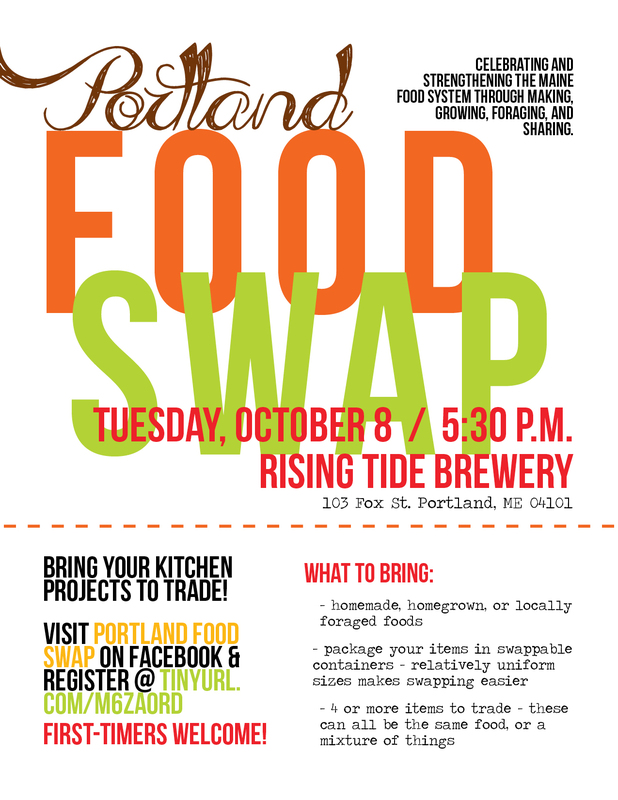 Just like last time, the food swap will be held at the fabulous Rising Tide Brewery in Portland (103 Fox Street), and begin at 5:30 p.m.
Never been to a food swap, or have no idea what the heck I’m talking about? Check out my blog for the Live Work Portland website, which gives a quick food swap 101, and recap of the Portland gathering held back in July. If it strikes your fancy you can optionally RSVP here, and for those of you in further reaches of the state, country, and globe, keep your eyes peeled for an update from my kitchen soon!